Wigan Territorials, Manchester Regiment, c. 1914. Lancashire’s contingent of the Territorial Force had two divisions, East and West. The Manchester Regiment was part of the East Lancashire Division. Each Regiment had fourteen Battalions of approximately 1000 men. The Wigan Battalion (5th) consisted of Wigan (A to E), Patricroft (F), Leigh (G) and Atherton (H) Companies. County Associations were responsible for its administration and military authorities for training. The Territorial Force (TF), established in 1908, replaced the existing Local Volunteer and Militia units, and was conceived primarily as a home defence force. Their organisation and training reflected this. The attitude of mind behind the derogatory phrase, ‘Terriers playing at soldiers’, resulted from policies and practices that were detrimental to the Terriers. They revealed a leadership out of touch with the realities of the lives of the working men who formed the battalions; their leaders expected too much for too little and expected part-time volunteer recruits to attain the same level of proficiency as professional soldiers. Young men of ‘good character’ initially enlisted for four years, and submitted themselves to military discipline. They were required to attend their local Drill Halls twice weekly after work – men who worked night shifts attended during the day. This was non-negotiable. At the Drill Hall, Terriers were introduced to the rudiments of soldiery. They were not passive recipients of training. They had targets to meet. The main focus, apart from Drill, was rifle training. The programme involved weekly target practice in the Drill Halls, progressing to firing at a local Miniature Range, then further training and assessment at the Regiment’s Rifle Range at Stalybridge. 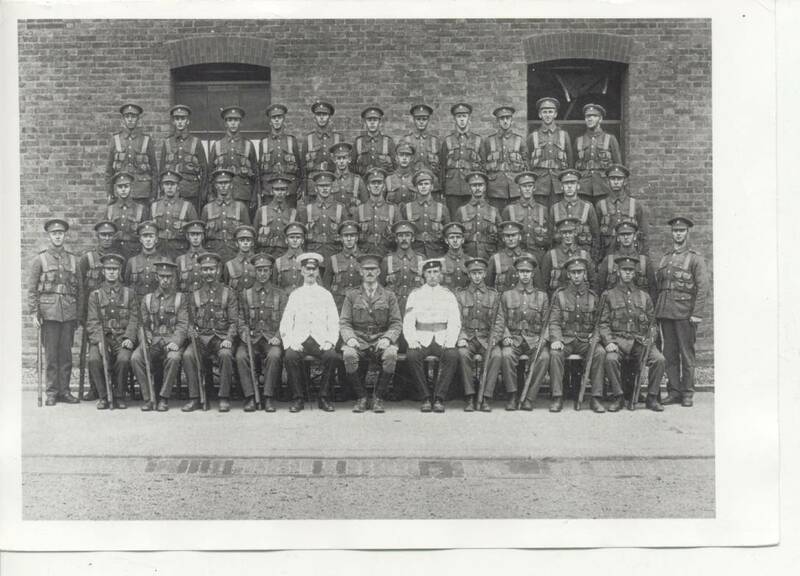 Apart from personal awards (proficiency certificates) they were encouraged to compete within their own company, between other companies at weekend camps, between other Battalions within their Regiment and both within, and as part of, the East Lancashire Division, against other divisions at annual camps. Using a similar pattern, moving from personal practice to larger theatres, Terriers developed their marching expertise. Hence, from Drill Hall practice to participating in local recruiting parades, then widening their sphere. The Battalion marched at the head of the procession for the Maypole Colliery Disaster Memorial Service, from the tram lines at Platt Bridge to Abram. In this instance they were soberly dressed in green serge. When they Paraded to Wigan Parish Church and received their Colours at Haigh Hall, they paraded in their ‘walking out’ uniform of scarlet and white. Highly visible, they marched from their Drill Halls (Powell Street, Wigan, Ellesmere St, Leigh, Mealhouse Lane, Atherton, and Cromwell Road, Patricroft) to railway stations en-route to weekend and annual camps. They took their place among the 16,000 troops of the Manchester Regiment marching past King Edward at Worsley and participated in mass marches at multi-divisional camps at Salisbury Plain and Aldershot. The training objectives at Camps focussed on preparation for war-readiness. A vital component of this was the camaraderie necessary to create a viable fighting force. Within the self-contained military world of the camps, Terriers shared with others of like mind activities designed to foster feelings of pride, belonging, team spirit, loyalty. They moved from being motivated by personal, to group achievement, through inter-Battalion/Division Football matches – the 5th’s team was the ‘All Blacks‘ – wrestling, boxing, marching, shooting competitions and of course war-games. However, attending camps did pose serious problems, some of which had direct links to the parsimonious nature of funding. In 1908, the Battalions of the Manchester Regiment attended a mass camp on Salisbury Plain. On arrival, the 5th had to march ten miles in pouring rain, most without greatcoats, some wearing civilian clothes, then sleep on sodden ground without sufficient tent boards during their time at camp. Many returned ill. 400 Lancashire men were hospitalised, many with pneumonia. Other health related issues were more chronic. Most of the 5th Battalion’s Terriers were miners or mill workers, whose long hours and poor working conditions took their toll. These young men – they were mostly young, aged 19 and under – went directly from work to camp and after further exhausting themselves travelled home in time for work early next morning. For instance, whilst at weekend camp at Parbold, local Terriers were required to sleep in ditches, again in atrocious weather conditions, then due to lack of funds, march back to Wigan late on Sunday. Government showed no real understanding or empathy for the economic reality of working men, who, without security of tenure (many miners were datallers), could not risk two weeks absence – or even a Saturday away – from work. Unsympathetic employers could simply replace them. Unemployment or underemployment (no Saturday overtime) could result in hardship or destitution for themselves and their families. The camp allowance of one shilling a day was totally inadequate. Despite constant pressure to introduce a married men’s allowance, compensate for loss of earnings or refund the incidental expenses incurred by ordinary Terriers, no progress was made. By the end of 1913, Terriers were better provided for, but were still often out of pocket. Mandatory attendance at Annual Camp posed specific problems in Lancashire cotton towns, with their rolling timetable of Wakes Weeks. Should Annual Camp not coincide with your town’s holiday week you were stuck; you either went to work and fell foul of military law, guilty of being ‘absent without leave’, or went to Camp and risked your job. Yet being a Terrier was not without its rewards. There was, of course, the emotionally uplifting experience of marching to the catchy and jaunty popular tunes and songs played by military bands – perhaps with a bit of a swagger? – through their home towns, maybe watched by friends and family. For all the negative criticism in the press this type of personal experience must have been affirming. As well as pride and self-respect, being a terrier also offered opportunities to widen horizons, and not just literally by travelling outside their immediate environment. They also got the opportunity to develop knowledge and skills not normally open to them including Drill Hall classes in musketry and the use of the Maxim gun, medics or signalling training. Though not a ‘Pals’ battalion as such, much of their military identity was matched by their identity as miners or mill workers. They shared personal experiences of their work and neighbourhoods. To the Terriers, alongside their fellow mill workers and miners wearing their Sunday best Monkey-toed clogs as they marched off to War in 1914, the experience would not have felt completely alien. Thanks to Yvonne Eckersley, a volunteer at Wigan Archives, for producing this fascintaing blog post.